Restaurant Flooring - Which Oak Flooring Is The Way To Go? Home/News/Restaurant Flooring - Which Oak Flooring Is The Way To Go? 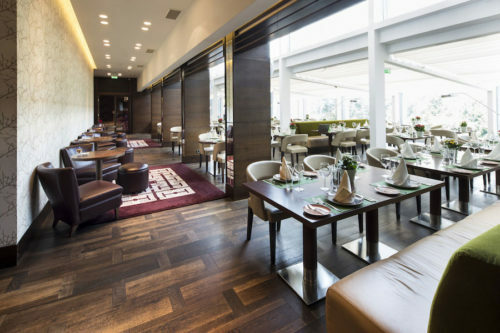 Restaurant Flooring – Which Oak Flooring Is The Way To Go? Oak flooring is becoming exceptionally popular for use as flooring within restaurants, the reasons for this are numerous. Oak flooring provides stunning aesthetics, due to the wide number of surface finishes available it can be utilised to seamlessly integrate within the surrounding theme. This flooring type offers tasteful aesthetics, unlike some other materials, that do not impede upon the space within the interior. When selecting oak flooring for your restaurant, perhaps the hardest question is as to whether you select solid oak flooring or engineered oak flooring. It can be a difficult decision to make, and is one we hear a lot. If asked for an answer as to which of the two we personally prefer, you may be surprised to hear that we would choose engineered oak flooring. The primary reason for this is that provided this flooring type is correctly installed, it behaves far better within an interior than oak flooring does. Unlike solid oak flooring, which is literally a solid piece of oak that has been crafted into a flooring plank, engineered oak flooring is comprised of an oak surface layer that is bonded to a plywood core. The plywood core is made up of numerous layers, each of these layers runs in the opposite direction to the previous. As part of the construction process, all of these layers are bonded together utilising boil proof glue. This creates a cross-grain structure, meaning that if the wooden fibres are forced either to “take on” or “give off” moisture and subsequently expand or contract then each layer is restrained by those surrounding it. This creates exceptionally strong dimensional stability. The outcome of this process is that engineered oak flooring is far less likely to be affected by any changes in humidity and/or moisture which occurs within the interior Additionally, engineered oak flooring can be installed at virtually every level within your restaurant, providing that the correct installation procedures are observed. Oak Flooring Online provide an extensive range of both solid oak flooring and engineered oak flooring options. In addition, we offer a dedicated product range of oak flooring that is suitable for use with underfloor heating. All of our oak flooring solutions, irrespective of type, are available in a wide range of surface finishes, enabling you to select the optimum solution for your interior. For further information about our product range, a member of our dedicated customer service team can be contacted by calling: 0800 043 3073.